Ever since I decided to embrace my grays, I find myself obsessed with gray hair – mine, yours, and every woman’s! I try to explain this feeling to my husband (that going gray is a BIG FREAKING DEAL for women), but I get muddled. He’s 100% supportive, but I can’t help but wonder if men are mystified by the intense feelings women have about their hair. Let’s face it, hair seems like a silly thing to get worked up about when some days it feels like the whole world is falling apart. But even knowing that, I can’t help it. Since the day I declared myself ready to ditch the dye, I have felt profoundly liberated and happy. I’ve had a burst of creative energy. So, I’ve been thinking a lot about it and came up with a few thoughts about why going gray is such a big deal. I’ll admit, turning 50 was a little rough. My beauty was important to me. I was awkward-looking for a lot of my teenage years (I’m not kidding when I say that people still scream when they see my 8th-grade photo), but I hit my stride around 18 and had a lot of confidence about my looks up until recently. The past few years have been stressful, and my skin has taken a hit. I’ve had sleepless nights. But our family recently lost a friend at a young age. She left behind young children. It made me rethink this whole hating growing old thing. Being here on this Earth and spending time with my kids, my family, and friends means more to me than being young. Every day I can have with them is a blessing. Once I stopped caring about looking younger than my age, I felt incredibly free! Guess what? I’m a 51-year old woman. That’s nothing to be ashamed about! I have years of learning and experiences behind me, and I wouldn’t trade those years for anything. I’ve never fit completely into mainstream culture. My taste in music, art, books, and TV is pretty eclectic. My friends have almost always been people in the arts. 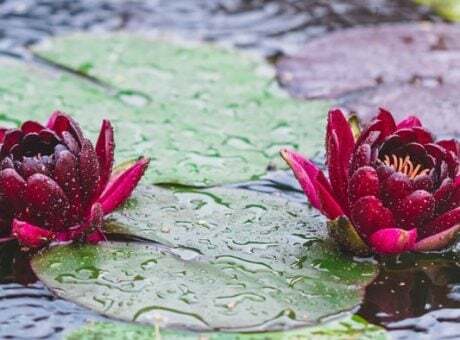 For years, working a full-time job in a corporate environment, I’ve had to conform to business norms and my personal style has been toned down. I used to dye my hair magenta in college, and I’ve missed the freedom to do something nutty with my hair. But now that I’m letting my silvers show, and I’m walking around the office with multi-colored “calico” hair, it feels SO freeing. It feels rebellious and fun. Whether or not you consider yourself a feminist, ask yourself this question: Is it right that men are allowed the freedom to display their grays, but society expects women (especially young women) to cover them up? My hair is nobody’s business but mine. Whether I choose to dye or not is for me alone to decide. Part of the reason I started thinking about going gray, actually, was the #metoo movement. Women need to let the world know what we won’t stand for, and even though hair might seem like a minor issue, it’s really not. Throughout history, women’s hair has been a symbol for femininity and virtue or vice. Think of the cultures that insist that women cover their hair because it might drive men towards acting out their lustful thoughts. Or consider all the myths about women’s hair (Rapunzel!). Really, people, it’s just hair. And it’s your hair (or my hair) to do with what we choose. Rant over! And if you want to see how other silver sisters feel about this transition, check out this post – it’s a doozy! How about you? What feelings has going gray unleashed in you? I’d love to hear from you in the comments! Well said. At one point we need to stop worrying about other people and do it for us. I stopped dying my hair in April of 2018, and after a few months a friend came and told me to not listen to what anyone says, that the grey is beautiful. In October I went from shoulder length to a long pixie, next haircut all the colour will be gone. It is liberating. A young girl in the office told me that she asked her hairdresser to remove the colour from her long black hair, was so disappointed when she was told that her hair would fall out, and is now jealous of my silver! Wow, what a great story Tracy! It’s wonderful that your young colleague was inspired by you! Since I stopped coloring my hair 8 months ago, I have felt a lot less anxiety and more confidence. It has been life changing! I’m so glad you’ve experienced that, too!! It’s such a great feeling! Love your manifesto! I agree with everything you stated. Additionally, I had the thought earlier today that these poor guys have to go gray so if we’re truly “equals” we should have “the nerve” ( was going to say “the balls” lol) to go gray too. I just want to be me. Tired of living up to fake ideals. Agreed! I really hope that we can get more women to reclaim their gray hair. Why hide it? Glad you enjoyed the manifesto! I have a young-looking face, which does not bode well in the business world. It’s hard to earn respect and be treated appropriately because of how you look. So, at 42 I have decided to grow my grays to reveal I am not this “little girl” that people want to treat me as. I have earned my stripes and I’m tired of feeling like I have to hide them. It has been such a liberating experience. At six months in I am proud of my natural color and cannot wait for the final result! How wonderful! Good luck to you with your transition! I swear, I could have written just about every word here. Turning 50 last year really bothered me, too, even though I usually embrace birthdays. And then one day I realized that part of what bothered me was this pressure to keep chasing that unattainable illusion of youth. What if someone actually, gasp!, guessed my real age? And then I started thinking, so what? Why can’t I just BE my real age? What’s so wrong with that? Once I made the decision to let my natural hair grow, it was an enormous relief. This is who I am, this is the age I am and that’s OKAY. And frankly, I do love that I’m giving the big middle finger to society’s idea of how women should age and what we should look like. It’s very freeing. By the way, my husband is also mystified by why this is such a big deal. He was encouraging me to embrace my natural hair way before I was ready. Amber, so glad you liked it! I hope more women join the Silver Revolution. It’s so liberating to stop hiding our age and our grays! I think I am the weird one because I needed to go grey. I was so tired of being treated like I was too young. I was pulled over by the police until I was 30, thinking I was too young to drive. The weird thing is men compliment me all the time on my hair and not in a weird way. They tell me that they admire a woman who doesn’t dye their hair. As I grow older, I’m 63, and my hair is more grey, I actually am thinking of dyeing my hair for the first time. I think I could rock light lavender or pink. Light lavender or pink sounds awesome, Dawn! I’ve heard from a lot of women that men are more OK with their grays than other women are. I went grey in a big way—by buzzing my already pretty short hair down to almost nothing! So I lopped off color and length all at once! (Wanted to go completely bald but didn’t quite have the courage). Had seen a beautiful young woman in her 20s do it—she became *more* beautiful when she got buzzed! Watched a documentary about bald women—very inspirational! When I realized how scary it seemed, I decided it was just the thing I had to do (face my fear). Realized people might assume I was lesbian (not that I’m aware), or feminist (yes! ), or a feminazi (no! Horrid word! ), or a cancer survivor (good to experience some of what they go through? With regards to hair). Did it anyway (figured I could grow it back from summer to Xmas if I hated it). So, really, going grey was an overnight experience, so to speak, and so it was like doing a cannonball into cold water—easier, I think?!?!? I wish I had done it earlier! Think of the money I could have saved! My head/brain/creativity have been liberated! (I rub the crown of my head for inspiration). I could go on and on. Strangers give me compliments. Everyone at work loved it. I sometimes consider growing it out—I do look at long tresses something new with longing—bug my hair tells me emphatically “no.” I think I’ve inspired at least one other woman to give it a try! Sorry so long! Awesome, Denise! I’m sure it feels so liberating!! Yes, yes, yes to all of the above! I have never considered myself a rebel, am a pretty strict “rule follower”, but the decision to stop dyeing has brought out the rebel in me and I am loving it. I’ve had the occasional wobble but honestly it has gotten so much easier. Just stepping off the 4 weekly root touch up cycle is so liberating. I get some looks from people…eyes up to hair, eyes down to face and repeat a few times! No negative comments though, the odd “you’re so brave” or “there’s no way I could do it”. Each to their own. I hope this movement grows and grows. Much like our silver shining hair. I agree, Claire – hope this movement keeps growing and growing. It would be nice if we were the generation that broke the notion that going gray is only for very elderly ladies. I started going gray at 16, as do many others. I’m glad to see so many young women in their 20s and 30s embracing their silvers – it’s a time saver, money-saver, and it just feels so darn liberating! Joanna, anyone who sees your Instagram feed can see how much fun you are having being you! 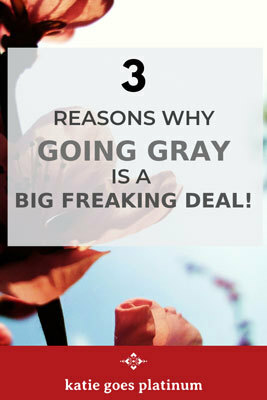 Going gray can definitely provide a great time of self-discovery!